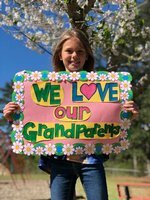 Second grader Hannah Horne, daughter of Michael and Christine Horne of Americus, enjoyed preparing for the Southland Academy Grandparents Day celebration. The Southland Academy Lower School students were excited to perform for the 2019 Grandparents Day program. This year's theme "Down on the Farm" proved to be a fun and exciting musical presentation. The students' attire lent itself to the theme, and their enthusiasm was quite contagious. The audience enjoyed the familiar tunes and the new songs alike. Davis Holloway and Cade Futch helped with the emcee duties as they welcomed students to the stage and entertained the audience with lots of "Down on the Farm" humor. Music Director, Heather Grinolds, presented a wonderful musical to recognize the very special guests, the students' grandparents. Southland Academy is very grateful for our families and feels very blessed to honor our grandparents.